Perforated , Twisted , Tied , Repaired (local) ? Diam ext. = 305, diam int. = 190 x 155, W strip = 8.8 mm [RTS 28/6/2005]. 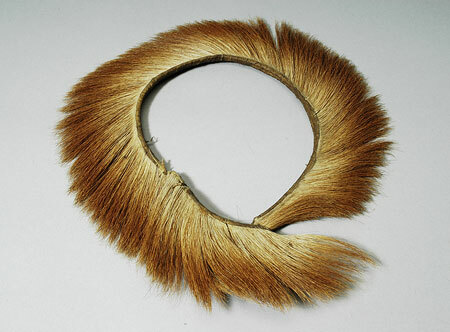 Circular collar for hanging around the neck of a favourite male calf, consisting of a narrow strip of giraffe skin, with a thick fringe of hair attached to its outer face, that is buff coloured at its roots (Pantone 7506C) and a deeper orangey red at the tips (Pantone 4635C). One end has been perforated, and the strip bent into a circle, with the other end pushed through the hole to close the loop. The strip appears to have broken on one side, and been mended locally using twisted plant fibre string to tie the broken ends together in two places, secured by knots. There are also a series of five shallow notches along the length of the strip, cutting into its outer face; the reason for these is not obvious, and they may relate to the way in which this piece was removed from the original hide, or have been done to allow the hide body to bend into a circle more easily. The collar is complete, but broken; there is also some damage near one end, where the small cut appears to have led to the strip becoming partially broken across its width. It has a weight of 63.9 grams and an external diameter of 305 mm, with the inside edges measuring 190 by 155 mm across the opening, while the strip itself has a width of 8.8 mm. This collar was hung around the necks of a favourite bull calf, and is known as gol. Accession Book Entry [IX, p. 16] 1931 [insert, in pencil] 66 [end insert] E. EVANS-PRITCHARD , Esq. Dec. Specimens collected by himself in the EASTERN SUDAN, viz. [...] [pencil insert, p. 18] 31 [end insert] - Hair fringe collar (of hide with hair attached), for necks of cattle, NUER. Pitt Rivers Museum label - Gol , made of giraffe skin, for placing around the neck of a favourite bull-calf. NUER (NATH), E. SUDAN. Pres. by E. Evans Pritchard, 1931 [ink, front]; 3 [pencil, back; rectangular metal-edged tag, tied to object; RTS 28/6/2005]. Related Documents File - Further details of this object are given in a letter from Edward Evan Evans-Pritchard to Henry Balfour dated 7 December 1931: "The circular thing is made of giraffe's skin and is called gol . It is placed round the necks of favorite male calves." Sparks, Rachael. "Nuer cattle collar" Southern Sudan Project (in development). 03 Jan. 2006. Pitt Rivers Museum. <http://southernsudan.prm.ox.ac.uk/details/1931.66.31/>.